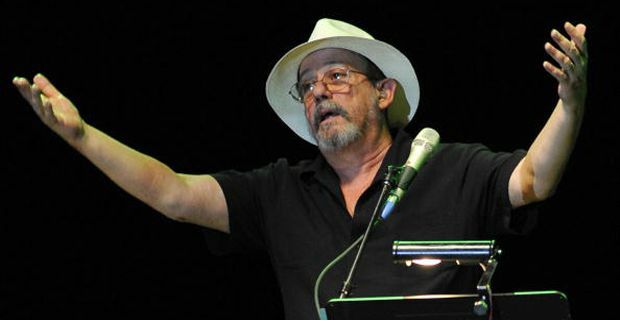 Cuba’s most famous musician and cultural icon of the island’s communist revolution, Silvio Rodriguez, has created a storm of controversy by jamming at two concerts with the blacklisted jazz musician Robertico Carcasses. Carcasses spoke out in a highly unusual fashion at a huge televised concert last week. During the sanctioned and state approved event that was ostensibly demanding the return of four Cuban agents imprisoned in the United States 15 years ago, he called for direct presidential elections, freedom of information and a new attitude towards dissent. Retribution was swift as the Ministry of Culture, which entirely controls both all live music and all recording on the island banned Carcasses and his jazz-fusion band, Interactivo, indefinitely from all state venues. In what may yet prove to be a seminal moment in the country’s recent cultural currents, his punishment has sparked a vigorous debate amongst artists and intellectuals alike. For the celebrated establishment bastion Rodriguez to flout the ban so flagrantly by inviting Carcasses to play with him demonstrates a new kind of challenge to the status quo and the power of the authorities to censor the arts and highlights a new degree of solidarity between the country’s artists. "I took the decision to do this precisely in the next two concerts, after learning that he had been sanctioned with an indefinite suspension from concerts and other public activities sponsored by the ministry," Rodriguez said in his blog. "I do not agree with the excessive sanction of barring a musician from doing his work," Rodriguez said. "As a Cuban citizen Robertico has the right to say what he thinks," he wrote. "I would have preferred that he would do this in another concert, in a record, somewhere else, because the struggle for the 4 agents freedom is sacred to the Cuban people." Carcasses was however unrepentant, issuing a statement that effectively repeated his sentiments, but apologising to the agents’s families for hijacking the event as well as apologising to his own band who had not been pre warned of his outburst. "I want ... free access to information so I can have my own opinion. Elect the president by direct vote and not another way ... Neither militant nor dissident, all Cubans with the same rights,"